← A variety of recent courses at the only roof training centre in the South! The next Heritage Skills NVQ Level 3 Diploma Specialist Apprenticeship Programme (SAP) is now under way at South Coast Roof Training Ltd. 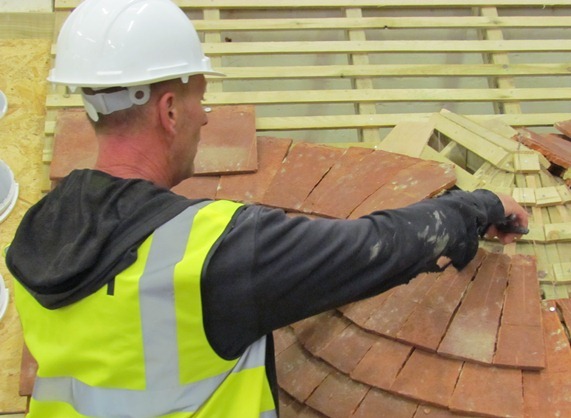 Currently the candidates are covering the plain tile element of the course. This will include a field trip to Keymer Tiles Ltd in Burgess Hill and also a field trip to a ‘live project’ at the Weald and Downland Open Air Museum in West Sussex. The CSkills Apprenticeship programme is now running. 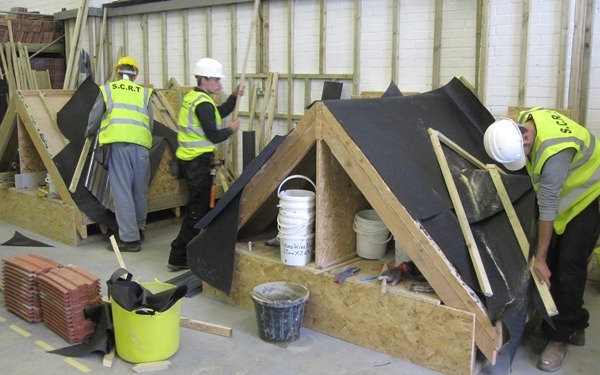 The candidates have been learning the basics, felting, battening and laying interlocking tiles on to roofing rigs. There will be two NFRC funded, (FREE to NFRC members) solar courses running – at the end of October for Flat roofs and in mid-November for Pitched roofs, which are now fully booked. There are further NFRC funded courses planned for early in 2013, dates to be announced soon, keep checking our website for updates. If you are interested in attending either of these courses please contact us to register.